Value for money home & office Rexel DUO shredder is designed to be practical and convenient when you work from home or small office. Protect your confidential and valuable information from being stolen by shredding any documents that may put your home or business at risk from identity fraud. 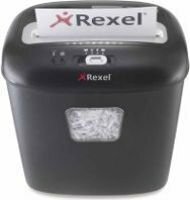 The Rexel DUO shredder home/office shredder is an ideal space saving under desk model and has a DIN S3 security level which means that it shreds paper into unreadable confetti style particles (sized 4 x 45mm) making it ideal for confidential data. The DUO shredder is a general use shredder that can shred up to 11 sheets of 70gsm paper in a continuous single feed as well as fastened with paperclips and staples. CD’s, and credit cards are destroyed via a separate CD shredding unit with separate bin. Designed for regular shredding, it features a 17 litre bin with viewing window that holds up to 100 sheets of 80gsm paper. With a clear LED indicators the DUO shredder is a good choice for a busy home and office worker who requires a shredder by their desk side. Weighing 4.4kg and sized at 348(H) x 386(W) x 232 (D)mm, the DUO shredder comes with the extra peace of mind of a 2 year warranty, an extended warranty on the cutters plus it is compliant with finger safe international standards and is CE compliant.